Home Equestrian News Al Sharbatly races to victory in the Prix du Qatar. Al Sharbatly races to victory in the Prix du Qatar. 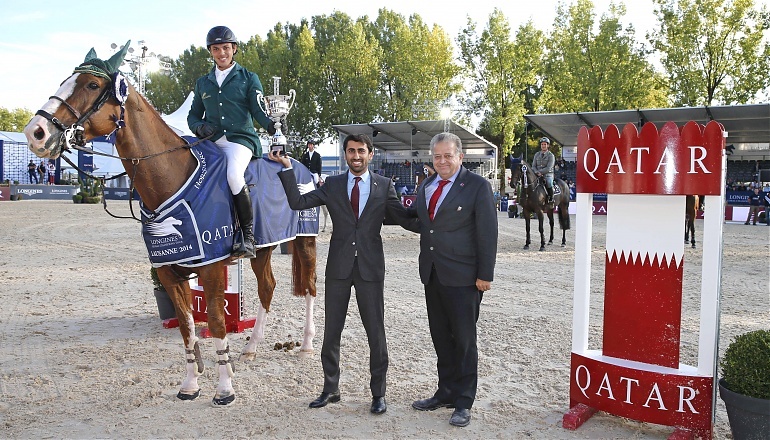 The final CSI5* class of the Longines Global Champions Tour of Lausanne, the Prix du Qatar, was won by Abdullah Al Sharbatly (KSA) with Andrea. Second went to recent World Championship Team Gold medallist Jur Vrieling with VDL Zirocco NOP and 3rd to young rising star Bertram Allen (IRE) with Romanov. The class was a fast and furious race against the clock which had the crowd rising from their seats in excitement as each horse crossed the finish line. The first round was a technical course built by Belgium’s Luc Musette, demanding precision and control, and clear rounds were few and far between for much of the first half of the draw. Meredith Michaels-Beerbaum (GER) and Atlanta, 11th to go, were the first to manage a clean round, swiftly followed by Philippe Rozier (FRA) and Rahotep de Toscane. A tough combination across the arena – a wide oxer going in followed by two short strides to a double of uprights – was particularly troublesome; as was the penultimate double of LGCT uprights tight out of a corner. The sun beamed down on the lakeside arena for the third day in a row, as buzzing spectator stands enjoyed the final showdown between some of the best horses and riders in the world. As the class progressed, the competitors seemed to get the hang of the tricky test set for them and clear rounds began to accumulate – Janika Sprunger (SUI) with Uptown Boy, Alberto Michán (MEX) with Camilo La Silla, Martin Fuchs (SUI) with PSG Future, Rolf-Göran Bengtsson (SWE) with Unita ASK and Denis Lynch (IRE) with Querida all progressed to the 14-horse jump-off. The shorted course against the clock consisted of eight obstacles and was scattered with lone flimsy uprights. The first three riders all lowered fences attempting to set a strong time to beat. Cassio Rivetti (UKR) with Seacoast Forlap chose to ride a more cautious clear which was immediately bettered by Edwina Tops-Alexander (AUS) with Fair Light van T Heike; however, Simon Delestre (FRA) with Ryan des Hayettes then attacked at full tilt and wiped 5s off her time. It looked like the Frenchman would never be caught, but amazingly Emanuele Gaudiano (ITA) with Admara 2 did just that from the middle of the draw, but he was followed by Jur Vrieling who went even faster again with his big-striding mount. Sharbatly had the benefit of being late in the draw and his super-careful mare never looked like touching a pole, no matter how he dared her. Bertram Allen followed but he couldn’t cover the ground at the speed Sharbatly did. Next stop for the Longines Global Champions Tour is Vienna this coming weekend and our host venue this season, Magna Racino. Vienna offers the top ten Championship contenders their last chance to grab vital points before heading to Doha in November. Germany’s Ludger Beerbaum took over the No1 spot from Sweden’s Rolf-Göran Bengtsson in yesterday’s Grand Prix and now holds a narrow lead of just 15 points. Having had one of his best season’s to date, this could well be Beerbaum’s year to be crowned LGCT Champion if Scott Brash (GBR) doesn’t catch him. Previous articleBeerbaum takes control of the Championship following a battle between Legends. Next articlereland’s Denis Lynch wins the opening CSI5* class of Vienna.